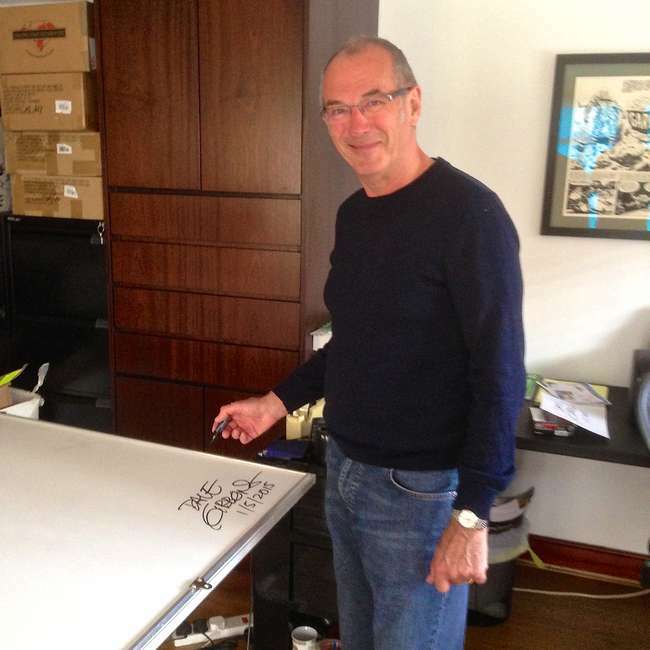 Dave Gibbons is auctioning off a gallery-scale print of WHAAT?, his barbed parody of Roy Lichtenstein’s WHAAM!, in support of the Hero Initiative, a charity that supports comic creators in need. A couple of years ago, the Tate Modern art gallery in London staged a major retrospective exhibition of the work of Roy Lichtenstein – a leading member of the Pop Art movement who based many of his best-known paintings on images appropriated from comic books of the time. The fact that Lichtenstein is lauded as an artistic genius while the creators of the images he appropriated – including industry giants like Jack Kirby, John Romita and Joe Kubert — remained uncredited has long been a sore point in the comics community, and the publicity surrounding the 2013 exhibition prompted a response from designer and artist Rian Hughes. 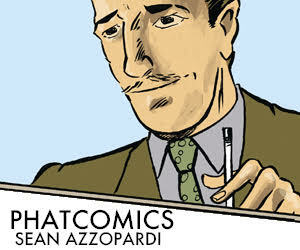 He issued a call to action for comics artists to re-appropriate one of Lichtenstein’s images and to “warp and twist it into something interesting and original”. Thus was born the Image Duplicator project, which led to an exhibition held at London’s Orbital Comics in May 2013 (reviewed by our editor-in-chief Andy Oliver here). Dave Gibbons has been among the most vociferous advocates for the artists to receive their due, and a gallery-scale print of WHAAT?, his contribution to the Image Duplicator show, is being sold later today (Thursday) by British auction house Ewbank’s, as part of its entertainment and memorabilia sale. The work (click at the top to enlarge) draws on one of Lichtenstein’s most famous paintings, WHAAM!, which itself was based on an image from All-American Men of War #89, published by DC Comics in 1962. The panel in question was drawn by Irv Novick, who was – as was customary at the time – never credited in the issue. However, did that anonymity mean that his work could be picked up as a ‘found object’ and given some sort of validity by a ‘real’ artist? Gibbons himself has clear views on the matter: “The feeling amongst the comics community has always been pretty much unanimous. 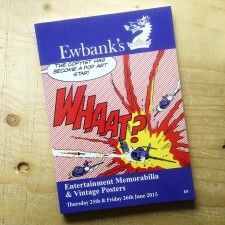 We feel patronised and we feel that several of our revered elders have been, frankly, robbed. The two-part work (reflecting the format of Lichtenstein’s “original”), is mounted in clear acrylic and measures 41 x 94 inches (104 x 238 cm). It is expected to sell for $2,300-3,800, and profits from the sale will go (as did the proceeds of the original exhibition) to The Hero Initiative – a US-based charity that offers a “financial safety net for yesterday’s creators who may need emergency medical aid, financial support for essentials of life and an avenue back into paying work”. It has so far provided more than $700,000 to comic creators in need. 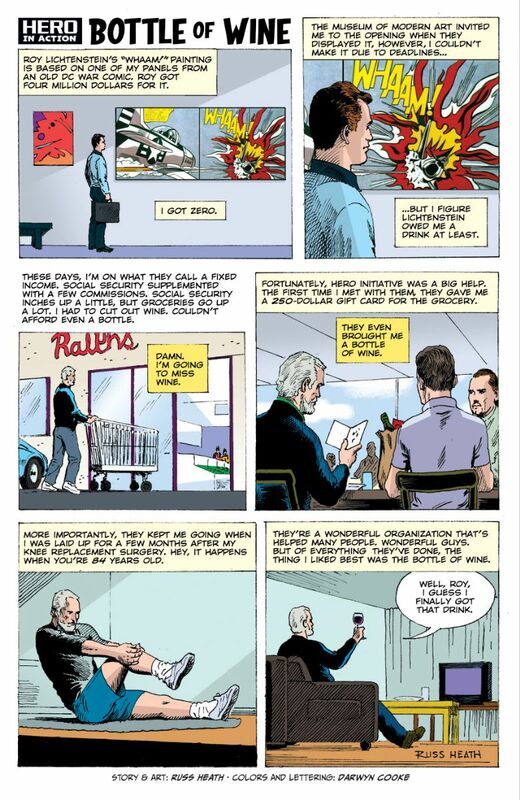 Let’s leave the last word to comics artist Russ Heath, whose work was also appropriated by Lichtenstein. He produced this page in 2012 to pay tribute to the help he received from the Hero Initiative. Chin chin, Russ! (Note: Despite a degree of confusion over the origin of WHAAM!, the essentials of Heath’s story have been confirmed; one of his frames from the same comic formed the basis for another Lichtenstein painting, BLAM! ).